Looking Back Awami League Governments Election Menifesto! By S. M. Anwar Hossain, ‘Shootout’, ‘Crossfire’, and ‘encounter’ all these words have the same meaning in context to Bangladesh. Like same licker in different bottle in different name. Taste of that licker is same as the meaning of these words are same – ‘Extra Judicial Killing’! According to Wikipedia, "Extrajudicial killings are the illegal killing of leading political, trade union, dissident, religious, and social figures by either the state government, state authorities like the armed forces and police (as in Liberia under Charles G. Taylor), or criminal outfits such as the Italian Mafia. Extrajudicial killings and death squads are most common in the Middle East (mostly in Palestinian territories and Iraq) Central America, Afghanistan, Bangladesh, India and Indian-administrated Jammu and Kashmir, several nations or regions in Equatorial Africa, Jamaica, Kosovo, many parts of South America, Chechnya, Russia, Uzbekistan, North Ossetia, parts of Thailand and in the Philippines." Bangladesh was introduced by this term formally in the year of 1972, just after the independence in 1971. Former President of Bangladesh, Sheikh Mujibur Rahman screamed out in the Parliament building just after the execution of the opposition leader Siraj Shikder. Since then that Awami League government continued too many ‘unknown’ executions by the Rokkhi Bahini, a Para Military force, formed by Mujibur Rahman. Later many human beings died during the Military regimes (1975 to 1990) just after the death of Bangladesh First President Sheikh Mujibur Rahman in 1975. During the interim caretaker government the density of this event extra judicial killing rose and by the campaign of the media and human rights defenders this event was introduced as a Para normal activity by the State. Peoples of Bangladesh raised their voice through media. Awami League declared in their election manifesto that it will stop the Jxtra Judicial Killing in Bangladesh. It will make a ‘Change’, as Mr. Obama, the President of the United States wanted to make a ‘Change’. Bangladesh Awami League wins the election and formed the government in January 2009. Now the people of Bangladesh started to realize that it was a lie. Just a big lie! The total number of extra judicial killing is 158 since Awami League came to the chair in January 2009. We remember the election manifesto that was declared by the Bangladesh Awami League in December 2008. And we also remember that extra judicial killing was introduced by the same party in 1972, while Sheikh Mujibur Rahman screamed in the Parliament -“Where is Siraj Shikhder Now?” Nothing has changed! Earlier BNP Started this process officially in 2004, i mean BNP gave this extra judicial killing an institutional form. And now Bangladesh Awami League develop the forms... they 'change' the name of this extra judicial killing process... 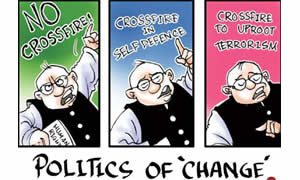 Earlier this was named locally as 'crossfire'... now they have 'changed' the name crossfire to 'Shootout' then they 'changed' it to 'encounter'...yes Anwar you are right 'Politics of ......Change'!! !